Party season is upon us and I've got some really cute dresses lined up on the blog to show you. 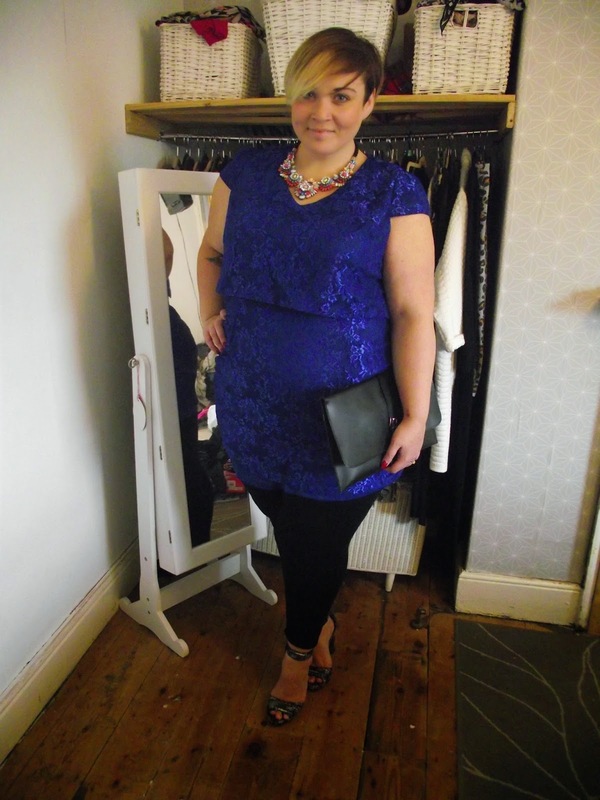 The first of which is from Lovedrobe who I think it's fair to say really specialise in plus size party wear, I know when I'm looking for something fun for a night out, Lovedrobe is one of my first stops. I chose this cap sleeve dress for two reasons, the electric blue is just stunning. All too often I find myself playing it safe in black, because I must admit I do love a good black frock, it's chic, it's a bit goth-y, in my head I'm one of the Olsen twins, but, there is much to be said for colour, when I see how it changes my skin tone and makes me look more illuminated I'm reminded why it's important not to wear black all the time! Secondly I loved the design separating the skirt from the top part giving the illusion of two separate pieces. I sized up to a 24 as I find Lovedrobe can come up a little small, I'm glad I did, I don't think I could have squeezed into a 22! It is incredibly short, hence why I've worn it with leggings, I'm not sure if that's just my personal comfort levels, but I don't think I could wear tights with it. This is really great party dress, perfect for any festivities you might have coming up! Beautiful dress - the electric blue is an amazing colour (and this is coming from a gal that's afraid of colour).